Born in Toronto, Canada, Joan Horsfall Young had a passion for art even as a little girl. She knew that she was not inclined to become a nurse or teacher as expected by her parents. Instead she chose to pursue her passion for art and attended Central Tech Art School, Toronto. Her appetite for art education led her to the Stowe School in Buckinghamshire, England and also California State University, Northridge in Southern California. In the mid 1970’s Joan moved to Southern California. Overcome by the beauty of the local light she began painting in the plein air Impressionist style. Whenever she has the chance to paint on location, she will do so. She is especially interested in using thick, buttery paint and a luscious full brush to express the way light falls on the material she has chosen to paint. Joan’s impressive career has resulted in her being a part of many exhibitions in California, United States and Canada. She is a member of the Oil Painters of America, An Artist Member of the California Art Club and a board member of The Artists’ Gallery in Santa Monica. 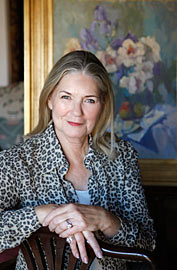 Her art has been published in numerous magazines and is a part of many corporate, public and private collections. She continues to be passionate about her paintings and she paints numerous hours most days. She spends two months a year in Ontario, Canada painting.